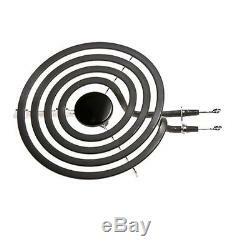 Maytag Jenn-Air Hardwick Compatible Stove 6 Burner Element Replaces Y04100165. Includes 1 brand new burner as pictured. This is a high quality, aftermarket element, made to replace the OEM items. Solid terminals (used to be wire loops). Fits many stoves from Maytag, Jenn-Air, and Hardwick. Y04100165 Y707456 Y703422 Y0E00601299 7406P048-60 74005446 715927 707456 703422 7-7456 7-3422 7-15927 550071 5-50071 4381748 19950010 15927 0E00601299 04100165. Compatible models include: (USE CTRL + F for a quick search). 22305 2300 2300ERS 2380EGS 2480 2513 2514 2514A 2514B 2515 62942015 62942865 62942869 88890 89890 A100 A100-C A100B A100B-C A100L A100L-C A100W A100W-C AC110B C200 C201 C201-C C202 C202-C C203 C203-C C206 C206-C C206B C206B-C C206W C206W-C CAE1000ACB CAE1000ACE CCE1400B CCE1400B-C CCE1400W CCE1400W-C CCE407B CCE407B-C CCE407W CCE407W-C CDE820 CDE850 CDE851 CDE852 CLE700 CNE200 CRE200 CRE200B CRE300 CRE300B CRE350 CRE350B CRE400 CRE400B CRE500 CRE500B CRE600 CRE600B CRE650 CRE682 CRE682B CRE700 CRE750 CRE750B CSE600 CSE601 CSE7000ADE CU230 CUE840 CVE1400B CVE1400B-C CVE1400W CVE1400W-C CVE407B CVE407B-C CVE407W CVE407W-C CVE4180B CVE4180B-C CVE4180S CVE4180S-C CVE4180W CVE4180W-C D-170 D-445 D-456 DCSE600 DCSE601 ED1-76W19 ED9-71A539R ED9-71W539R EPD8-69KY919A EPD8-69KY919W EPD9-79KA659A EPD9-79KW659A GCLE700 GCNE200 GCRE200 GCRE300 GCRE350 GCRE400 GCRE600 GCRE650 GCRE682 GCRE700 GCRE750 GCSE600 GO106 GO106B GO106B-8 JEA7000ADB JEA7000ADS JEA7000ADW JED8130ADB JED8130ADW LCLE700 LCNE200 LCRE200 LCRE300 LCRE350 LCRE400 LCRE600 LCRE650 LCRE682 LCRE700 LCRE750 LCSE600 LCSE601 NER1360AGH R200 R201 R201-C RC8700EDB0 RC8700EDW0 RC8720EDB0. Thank you for shopping with. We are happy to help in any way we can to provide a positive shopping experience! The item "6 Burner for Jenn Air Maytag Range Stove Element Y04100165" is in sale since Thursday, March 26, 2015. This item is in the category "Home & Garden\Major Appliances\Ranges & Cooking Appliances\Parts & Accessories". The seller is "yourpartsdirect13" and is located in Lenexa, Kansas.